When we think about our species’ future in space, we often imagine a network of large space stations, on-orbit factories producing large transport vessels, and giant imaging systems gazing deep into the universe’s history. That future is achievable, but it requires we think about more than just lowering the cost of launching to space. The International Space Station, the largest structure humans have put in space thus far, took more than a decade, billions of dollars, and dozens of launches and spacewalks to complete. Despite an incredible result, this construction approach won’t scale to meet future demand. A future in space that includes residences, industrial facilities, and transport stations needs platforms that allow us to manufacture and assemble large space systems in space. This year, under contract with NASA, Made In Space is leading a team to point our space-based manufacturing expertise squarely at this problem. 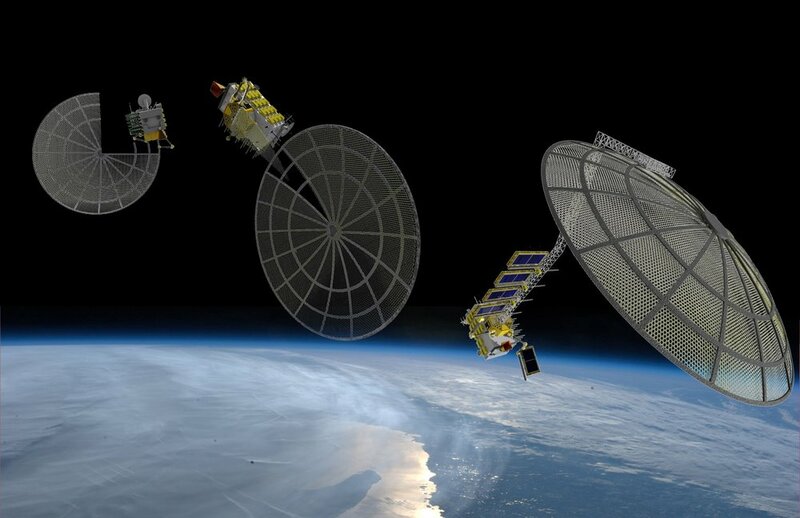 Under NASA’s Tipping Point program, Oceaneering and Northrop Grumman join Made In Space in embarking on the Archinaut Development Program. Archinaut is a platform that constructs, assembles, and integrates space-optimized systems into spacecraft. It is the first platform specifically designed to create large structures for space, in space. The first phase of the Archinaut Development Program will prove out spacecraft manufacturing and assembly technologies for NASA-led exploration applications, defense missions, and commercial uses. Future phases will see more complex on-orbit demonstrations and infusion of Archinaut technology into commercial and government missions. This will enable space-optimized structures and designs, rather than requiring designs to survive launch forces and -vibrations. In its basic configuration, Archinaut is a system integrated into a satellite and includes a space-capable manufacturing unit, assembly robotics, feedstock, and some prefabricated components. During launch, Archinaut is packaged extremely tightly, saving significant volume and mass over state-of-the-art deployables. Once on orbit, Archinaut goes to work, manufacturing space-optimized systems for the satellite. These systems include reflectors, antennae, trusses, booms, radiators, and the like. Construction is accomplished by a combination of the manufacturing unit and the assembly robotics. Archinaut’s manufacturing unit is unique in that at high resolution, it additively manufactures structures much larger than itself. This is a crucial innovation for in-space manufacturing since we don’t have the luxury of launching house-sized manufacturing units into space to produce car-sized reflectors. We want to launch washing machine-sized units which produce football field-sized objects. Archinaut enables that. Combining this manufacturing with assembly robotics allows Archinaut to manufacture not just large, but complex, functional structures. The assembly system can integrate functional components such as sensors, antennae, wiring harnesses, solar panels, and more into the spacecraft being manufactured on orbit. This allows the creation of not just space-optimized structures, but nearly entirely space-optimized satellites. The assembly robotics also facilitate integrating the manufactured systems with the rest of the satellite and provide the ability to reconfigure the satellite during its operational lifetime, turning satellites into modifiable, extensible platforms. Because Archinaut has at its core a high resolution additive manufacturing system coupled with assembly robotics, it is not limited to mere assemblies of trusses. It can create virtually any geometry. In addition to being optimized for space, any satellite equipped with Archinaut will be significantly more versatile and resilient. The Archinaut Development Program is part of our broader vision. We aim to enable people to sustainably live and work in space and on other planets. To make this vision a reality, we’re focusing on space-based manufacturing — the technologies that will ultimately support future spacefaring communities. As we look toward how these technologies and markets will emerge, we are convinced that government and private enterprise will increasingly collaborate the further into the space we push. As such, Made In Space is committed to continuing to offer both commercial- and government-oriented products and services in space-based manufacturing. Illustration of Archinaut robotically assembling an Archinaut-made extended structure to an existing satellite on orbit. We are proud to be the world leaders in in-space manufacturing. In 2014, Made In Space became the first company to manufacture objects in microgravity. Today, we are the only company to operate multiple manufacturing devices in space, as well as offering a commercial in-space manufacturing service. We serve customers every week by 3D printing objects from a variety of materials on the ISS. But our history is marked by collaboration with incredible partners. We first validated our gravity-independent 3D printing technology on parabolic flights provided by NASA’s Flight Opportunities Program. Next we contracted with NASA to develop 3D printers for the ISS. As noted earlier, the first printer went live in 2014, and continues to operate to this day. Our second device, the Additive Manufacturing Facility (AMF), operates in many different materials at significantly higher temperatures and can produce structures that can withstand the vacuum of space. Archinaut extends these capabilities. Because we’re the only company with broad experience additively manufacturing in space, we are uniquely positioned to continue developing next-generation space capabilities in a cost-effective fashion for commercial space interests. For six-year-old Made In Space, Inc., this program is a turning point. Alongside other Tipping Points winners like multibillion dollar defense contractor OrbitalATK and storied commercial telecommunications satellite manufacturing Space Systems Loral, Made in Space is developing satellite manufacturing technologies that will change how we use the space environment. Unique among the awardees, we are proud to be working with NASA to prove out the world’s first true space-based additive manufacturing and assembly technology. This program expands humanity’s ability to do more scaled, more impactful, more cost-effective, more capable operations in space. The ability to additively manufacture and assemble in space is a huge expansion of the space technology state-of-the-art. Archinaut will enable the responsive implementation of several terrestrial manufacturing capabilities to the microgravity environment. For the first time, we’ll be enabling an entire suite of on orbit manufacturing capabilities able to support the construction of a number of space-based technologies, from far-seeing telescopes to commercial space stations. That’s the future we’re making a reality. Don’t forget to visit the Archinaut and Made In Space websites.